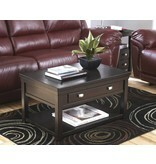 Item Description: With its clean lines and chic style, the Hatsuko coffee table is contemporary style at its finest. Dark finish pairs nicely with brushed-nickel-tone hardware, while roomy lower shelf offers ample space and keeps tabletop free of clutter. Additional storage under lift-top surface. 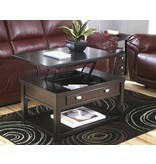 Series Features: Made with select veneer and hardwood solids. Rich dark brown finish. Casters and lift top on cocktail table. Brushed nickel color knob.